We are just about to commence a new building project in Northfield, Birmingham, involving a two storey side extension that is approximately 85-90 square meters. We’ve been involved in the this project from the outset, including plan drawing, planning permission and liaising with building control. The existing house at present is in the region of 85 square meters, including a garage conversion. With the new extension, this will take the house up to approx 175 square meters. 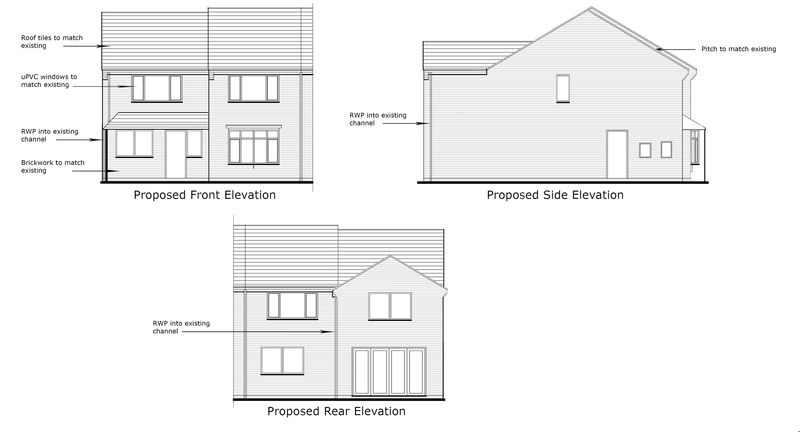 So we are more than doubling the size of the house – hence the need for planning permission – this extension does not fall under permitted development criteria. The existing dwelling has garage to the side, which was converted a few years ago. The side extension will supersede the garage conversion and turn the property from a 2 bedroom house, into a 4 bedroom house. There will be a new master bedroom with en-suite, a new staircase will be added, and the old staircase removed to provide a large open plan kitchen dining room. The new staircase will form part of a new hall way, which will see the front door relocated from the side of the property to the front. The ground floor will comprise a new hall way, study, utility room, WC and a new large lounge that will overlook the rear garden. The first floor will comprise of two new bedrooms, including a new master bedroom and ensuite. The relocation of the staircase, will result in one of the existing bedrooms being enlarged, this will accommodate additional wardrobe space. All 4 bedrooms will be double bedroom sized and will provide much needed space for the family home. This drawing is subject to copyright © David Vidgen 2017. If you wish to use this drawing, please contact us. On the left (proposed front elevation), this depicts the new extension. Set in brick and half from the front of the existing dwelling. The size of the extension is 4.725m wide, x 10.7m and has been done with brick calculations in mind (so we don’t need to cut bricks). Working to bricks is always a good idea because it saves waste and time. A Fisco Brickmate is our best friend when it comes to dimensions and laying courses etc. You will see from the plans that the new roof will both match the pitch of existing house and will also have matching roof tiles. Both the uPVC windows and doors will match, along with the brickwork. This is all standard stuff when it comes to securing planning permission. The extension will require building over a shared foul sewer pipe, so permission from Severn Trent has also been sought. This pipe currently runs from a deep man hole from the rear of the property to the front, and runs approx 800mm below ground level, through the middle of the current garage conversion. This is a 300mm pipe, so not only requires permission, but on completion a camera will also need to be inserted into the sewer system to ensure no damage to the pipe. The new WC, utility room and first floor en-suite will run into a new access chamber to the side of the property, which in turn will then lead into the existing sewer pipework located at the front of the property. To accommodate additional heating to the house, an overhaul of the current heating and pipework system will be required. At present much of the heating system features 8mm piping, this will be upgraded to standard 15mm copper pipe. The new ensuite and downstairs WC will of course be supplied by the combi boiler, this work will be carried out by our local bathroom fitter in Tamworth – RT Heating & Plumbing Ltd, who will also undertake any tiling and shower installations. We’ve decided to opt for open metal web floor joists, as this will allow easy installation of all pipework, foul pipes and electrical cabling. The benefits of open metal web floor joists is that you can run pipes and cables in any direction without having to drill holes in floor joists. They are also eco friendly because they use significantly less timber in their construction. The rear of the property will feature generous bi-fold doors from the new lounge. The downstairs utility room will provide access to the side and rear of the property without the need to open and close bi-fold doors. Anyone who owns bi-fold doors will know, as lovely as they are, they are not the easiest doors to open and close regularly. The bi-fold doors will also feature integrated and electric blinds, we recommend paying the little extra for this extra feature, particularly in households with children as they can damage other types of blinds easily. All guttering and rain water will be channelled into existing gully’s. Aco Hexdrain will run across the front of the bi-fold doors, as the patio area has a gentle slope towards the house. The new driveway will be block paving edges and installed by Aspire Driveways Birmingham, Block Paving & Patio Experts. Building control may require an appropriate soakaway, this will be installed if required along with Aco Hex Drain. The complete project will involve.